Thursday November 15th 1900 I came to West Liberty before noon. Ida Anderson met me at the depot and I spent the day with her till five oclock. They are very pleasantly fixed Ott met me at the depot at Iowa City and we were soon over to his house. Hattie came down to spend the evening I stayed there all night. Friday November 16th 1900 Will came for me early this morning we had a cold ride home. Mrs Evans had things in very good shape. We soon got dinner and in the afternoon I wrote to Mother and put my things away. Will and I talked all the evening. A letter from Mother. 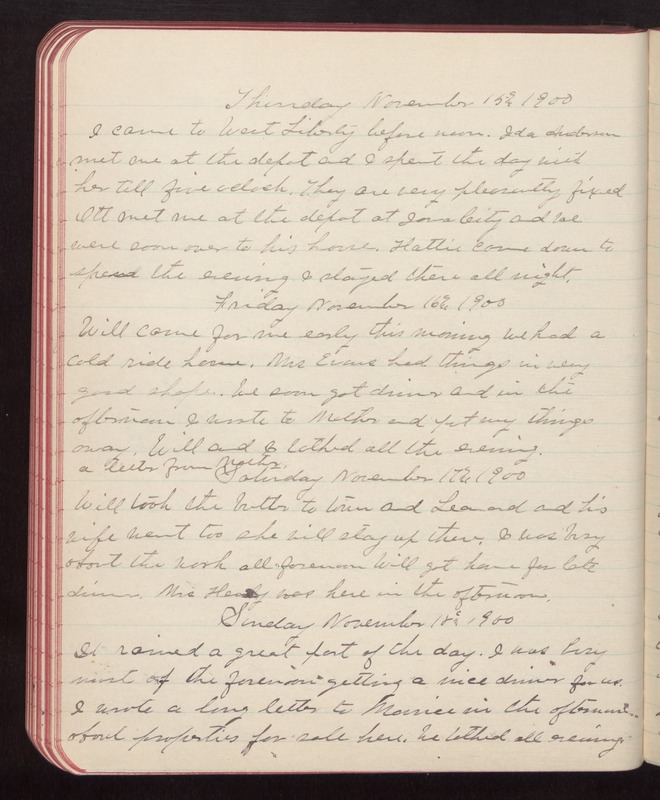 Saturday November 17th 1900 Will took the butter to town and Leonard and his wife went too she will stay up there. I was busy about the work all forenoon Will got home for late dinner. Mrs Henly was here in the afternoon. Sunday November 18th 1900 It rained a great part of the day. I was busy most of the forenoon getting a nice dinner for us. I wrote a long letter to Maurice in the afternoon about properties for sale here. We talked all evening.